1. Preheat waffle iron according to manufacturer’s directions. 2. In a large bowl, combine the flours and starches, baking powder, cinnamon and ginger. Whisk or stir to combine well. 3. In a small bowl or coffee cup, whisk together flax meal and warm water. Set aside until thick and egg-like. 4. In a small bowl or large measuring cup, combine the milk and apple cider vinegar. Allow to sit while you melt the coconut oil on the stove or in the microwave. 5. To the milk mixture, add flax meal, maple syrup, vanilla and whisk well. Lastly, add the melted coconut oil. Whisk well to combine. 6. Stir batter just until combined. 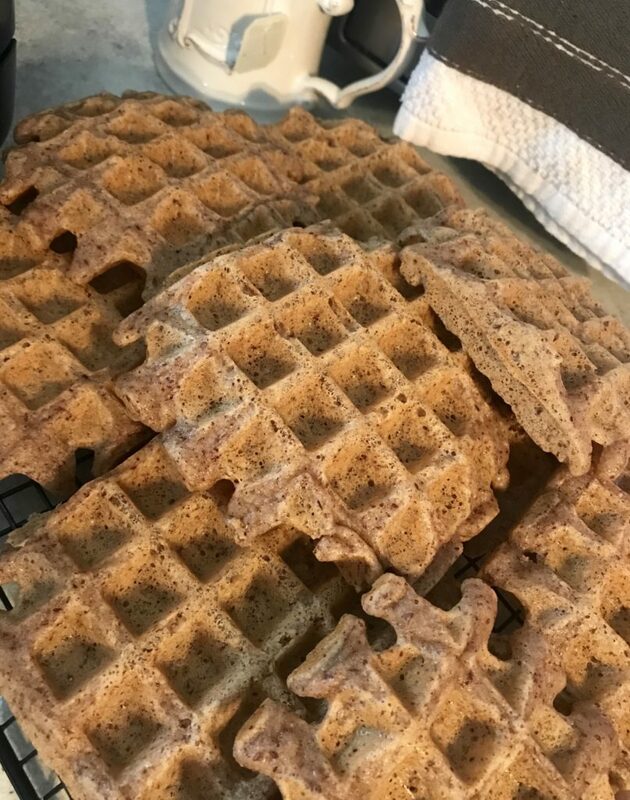 Using a ¼ cup scoop, pour batter onto preheated waffle iron and cook until golden brown. 7. These are so delicious you don’t even need any more maple syrup! Just enjoy as is.